Try to pull over in a well lit area as soon as safely possible. Consider turning off on a side street or onto an exit ramp, rather than stopping on a busy highway if there is one nearby. If that is not possible, get as far off the roadway as you can, to make it safer for both you, and the officer. Once you have come to a stop, turn the interior lights on, roll your window down, and turn the vehicle off. Don’t make any quick moves, or start digging through your glovebox or under your seats for any reason at this point. Leave your firearm where it is, and that should not be somewhere that is visible to the officer. Your driver’s license and your CPL card should already be together, somewhere it is very easy to get to. If possible (without digging around for them) have them in your hand before the officer reaches your window, and place your hands on the top of the steering wheel where the officer can see them as he approaches you. You should ask everyone in the car to sit still, keep their hands where the officer can see them, and shut their mouths during the stop unless you or the officer speaks to them. If someone else in the car has a firearm, you should also have their CPL and driver’s license ready. Never use a statement like, “I have a gun,” or anything like that. Sometimes using the word “gun” may cause a less experienced officer (say the nervous young recruit that you didn’t see walking up to the passenger side window of your car in the dark) to overreact. Remember to keep your hands where the officer can see them and don’t make any quick movements during the encounter. Be polite and compliant with the officer; now is not the time to debate your rights. As a CPL holder, you do NOT have the right to remain silent about your carrying status (you gave up that right when you applied for the permit). Never get out of your car unless you are asked to do so. Here is a good example of what NOT to do. Here is another. In certain circumstances, a police officer may want to take possession of your firearm. If this happens, follow the officer’s directions very carefully. He should not ask you to hand him the gun under any circumstances, as this would be very dangerous for both you and him. The police officer will return the firearm at the end of the stop unless the individual is being charged with a violation that allows for the weapon to be seized. Most police officers understand that a law-abiding citizen with a CPL that follows the law and discloses the fact that they are carrying is not a threat to them. A criminal carrying an illegal gun without a permit doesn’t normally announce that to an officer. 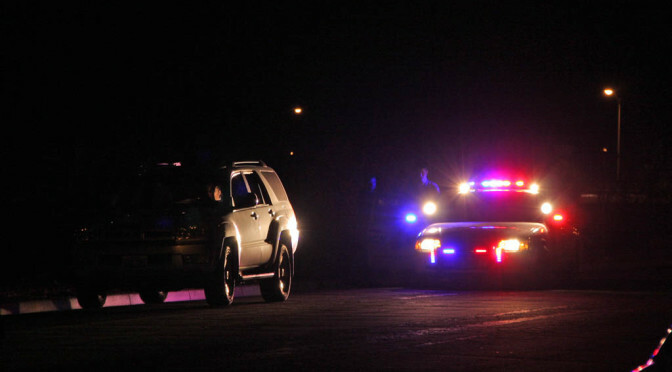 What if you have contact with a police officer outside of your car? The drafters of Michigan’s statute wanted to make it clear that you are considered in possession of the gun while you are in the car with the gun, even if it is not actually in your pocket or holster. If you are not in your car, and the gun is in your car, you are not “carrying” or in possession of the gun. However, an argument could be made that if it is within your “lunge area,” meaning you can easily reach it in one quick motion, it is in your possession. So, if you are standing near your car, there is a gun in the car, and you are “stopped,” meaning you are having some kind of official interaction with the officer (as opposed to simply saying “nice day isn’t it” as the officer walks by), you should probably disclose. I recommended that you disclose whenever in doubt. There is no negative legal consequence to disclosure. The only negative consequence comes from a failure to disclose.